Here we are already in 2014 and with the pleasure of releasing one of those new projects that we always love to host in our digital catalogue, this is the work by young artist Lucas Bolaño, from Madrid, presenting Amarga Anagrama. This is his first album since Vietnam Raw a wonderful work based on field recordings gathered as the title points in Vietnam. That was presentation letter at Sound-In event a few months ago. Impressed by the freshness of the proposal we asked him to deliver a work for Audiotalaia. 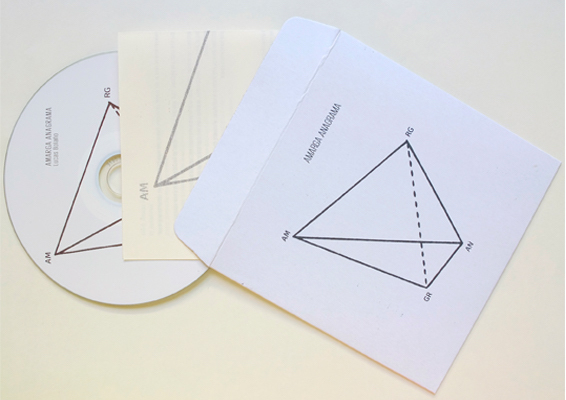 Amarga Anagrama is a compendium of various compositions based on electronics, guitar, effects and field recordings, sometimes processed sometimes not. As said by Bolaño this is a series of ideas, sketches, problems, solutions and improvisations. It seems like he’s breaking up with any kind of predictable construction, erasing from the map any trail or footprint of a premeditated process or goal. Consequently, the album drifts from and towards different corners of sound experimentation. 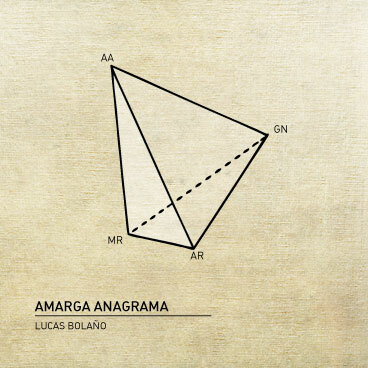 This a rich and multi chromatic album, full of details, twists and surprises at every compositional junction; Amarga Anagrama is a notebook, a travel’s diary; this album is a walk through the creative process of Lucas Bolaño music, an open book to it’s interests, phobias, sense of humor, and acknowledgement. To start the year with this beautiful work is nothing but promising. Happy new year! There is a certain exaltation of the daily life. Many of the works are compositions based of sounds generated by common objects surrounding me. The field recordings can be found without manipulation or transformed until unrecognition. I like the idea of building different things with the same source. Even that it share certain compositional techniques, Amarga Anagrama is a work quite opposite to “Vietnam Raw”, this was sustained over the aesthetics of exoticism. I’m not seeking to develop a specific discourse, idea or concept, but rather show a collection of works done in a time frame, based on the same form of composition: the repetition of elements (which sometimes are unrecognisable because of its manipulation), the copy-paste and manipulation. If there is anything constant in the disk, is the fact that all tracks come to pose a problem and find a solution. They are always an exercise of research. I do reference to anagrams and palindromes as a analogy of the drone or the copy-paste technique and the compositional aspects mentioned before. Certain structures found on various tracks are in fact sound palindromes. The guitar is the most present and active element on my work. I tend to use endings, or useless parts of recordings. I destroy it and use it to start new projects. It’s like messing up the canvas before starting to paint on it, just to have a starting point where to begin improvising and ultimately composing. According to this sometimes two pieces can have the same starting point and end up in different paths, different solutions to a problem. My work reminds me of povera art, because of the use of wasted, recycled or ordinary materials such us the noise of wind entering a car or percussive sounds over a fence. I’m concerned about finding the extraordinary into the ordinary; even if its through extreme sound manipulations, subtle EQ shifts or by how I relate with different sounds. I think every sound have something worth listening. I’m interested by small variations on a redundant sequence, specially in the case of drones. Slow progressions require a listening exercise, for the listener and the composer. A lot of work is put on very static sonic situations. The album is nothing more than a bunch of approaches, problems, solutions, improvisations,new ways to understand the same thing... But always taking care of the aesthetics, keeping a certain equilibrium with all of it. Dócil Cildo was recorded while working with Abajur a piece by Cildo Meireles. On this track I played with headphones as microphones, I knocking on metal fences and blowing on a stick. On Palindrone I used the sound of wind from inside a car driving towards Portugal. On Anagrama I the sound of beach sand with distortion can be heard. On Anagrama II a musical toy is used at Madrid Río Park. On La Sal, one can hear synchronicities between washing machine programs, sinusoidal waves and Sesame sliding on a pan. Boiling lentils mixed with a progressive looped guitar improvisation conform Ele y Erre. The treatment of the recordings is based on manipulation and automatisation of very basic elements such as amplitude, EQ, reflections, pitch and phasing. This experimental process starts knowing where to head and how but not knowing how its going to end up. La Sal by Lucas Bolaño (ELM) from Experimental Little Monkey on Vimeo. Physical Edition Self-Edited by Lucas Bolaño. Cost: 10€ + Shipping fees. Produced and arranged by Lucas Bolaño in 2013.